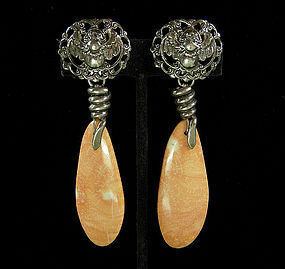 Very glam long clipback earrings in sterling silver with pale peachy pink agate or fossil stone drops. Marked STEPHEN DWECK and STERLING. The front of the clips are worked in repousse depicting Dweck's signature beetle. Guaranteed authentic, from an estate. Great size -- 3 7/8 inches long and 1 1/8 inches wide. Excellent condition. Photos enlarged to show detail.